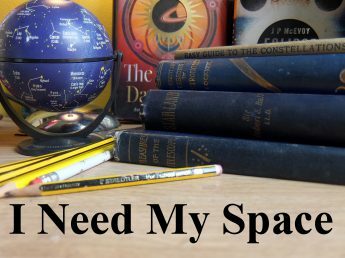 September | 2017 | I Need my Space! The little four-inch Skywatcher arrived Saturday, and of course it’s been cloudy since, such is the curse of a new telescope. But here it is in my place Saturday afternoon, it’s lovely! There was a clear spell earlier tonight, and a (four, five day old?) moon. I nipped to Penn Common quickly between lessons and rehearsals, and snapped this (actually a day lit moon, but I’ve boosted contrast and B/W it). Not bad for a quick snap from the side door of the van! And that’s the thing with this little scope. I may not have a picture that’s as sharp as if I’d taken it with my 8″, but I just wouldn’t have had time to set up my 8″. So it’s this photo, or no photo! Later I drove out to the ‘darker than Wolverhampton somewhat’ layby I use near Albrighton, but the seeing was terrible. Light clouds obscured all but the brightest stars. I took a few photos, just to test out the little scope as a camera extension. The picture of Vega above was 1/5 second, at 6400 ISO. I checked the pleasing pictures of open star clusters I took before the summer, and they were 1/2 a second at 6400. So next time I’ve got a clearer sky, I’ll try and take some longer exposure photos. In the meantime, I’ve been watching youtube tutorials on setting up an equatorial mount. After having one for nearly three years, it’s time I bit the bullet and learnt how to set the thing up properly. Earlier this year I took loads of photos of the moon, with a plan to map them out on rainy nights like tonight. This image on the right above was taken on the 9th January, at 400 ASA 1/125 second. It’s not stacked, it’s just a single shot. The moon I think must have been 11 days old at this point. The map on the left is taken from an old Phillips Moon Map. Using my Moon maps I can see crater A is Gassendi, B is Merseneus, C is Mare Humorum, E is Billy and D is Hansteen. Last year I bought a new Phillips Moon Map, but I’ve still kept the old one. I’m not sure which I prefer yet.